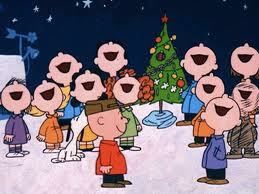 Christmas is filled with cheerful melodies and wistful songs. By mid-November, these tunes flood the radio airways and the shopping malls. By the time Christmas day is actually here, those same joyful tunes are driving us up the wall, and we desperately hope that we don’t have to hear them again for another year. We already know that “Santa Claus is Coming to Town” because he’s charged the whole trip on our credit card. Entire days have been spent making sure that the halls have been “decked” and it sure wasn’t a “fa-la-la-la” good time. It is sad but true that when Christmas day finally arrives, we find ourselves out of joy, out of time, out of money, and out of patience. This year may the carols we sing bring happiness to our hearts because they were orchestrated by the giggles of children, metered by the rhythmic front-door knock of a family member, and sung with the “hello” of a cherished friend. This is the song of Christmas: the simple things that remind us what life is about – family, friends, memories, and most of all Jesus. Just for fun, what’s the one Christmas song you wish you never had to hear again? This entry was posted in Christmas, Holidays on December 13, 2012 by aliciachall28. There are several songs that I could do without, but the Happy Christmas (War is Over) song by John Lennon makes me crazy! It’s a good message, I suppose, and I don’t mind it up until Yoko Ono starts screeching in the background. At that point I just want to stick my fingers in my ears and do the whole, “lalalalalala….” thing until it’s finally over.